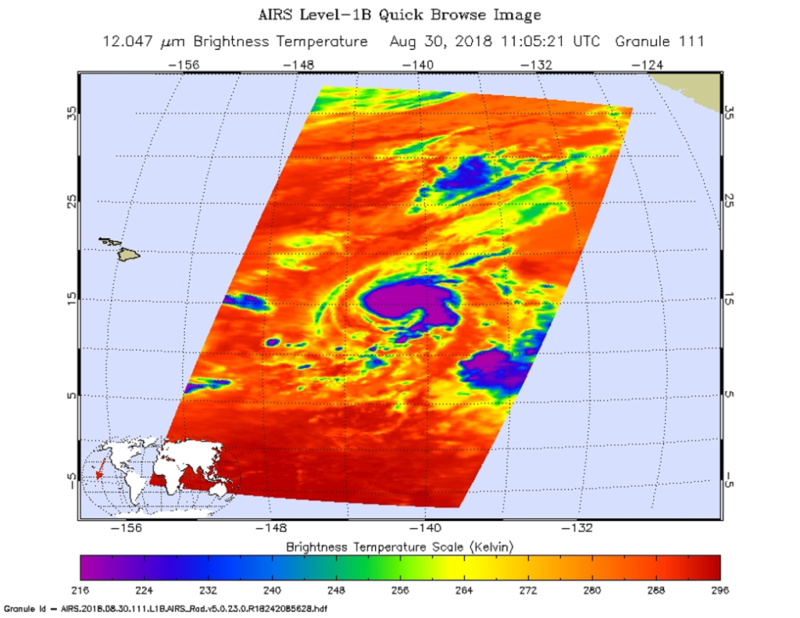 Hurricane Miriam continues to track north through the Central Pacific Ocean and NASA’s Aqua satellite analyzed the storm infrared imagery. On Aug. 31 at 7:15 a.m. EDT (1150 UTC) the Moderate Resolution Imaging Spectroradiometer or MODIS instrument aboard NASA’s Aqua satellite found the coldest temperatures of the strongest thunderstorms Hurricane Miriam were southwest of the center and were as cold as or colder than minus 80 degrees Fahrenheit (minus 62.2 Celsius). They were embedded in a large area of storms where cloud top temperatures were as cold as or colder than minus 70 degrees Fahrenheit (minus 56.6 degrees Celsius). NASA research has shown that storms with cloud top temperatures that cold (that are very high in the troposphere) have the capability to generate heavy rain. The Central Pacific Hurricane Center (CPHC) noted at 11 a.m. EDT (5 a.m. HST/1500 UTC), the center of Hurricane Miriam was located near latitude 18.3 degrees north and longitude 141.2 degrees west. That’s about 910 miles (1,470 km) east of Hilo, Hawaii. Miriam is moving toward the north near 10 mph (17 kph). This general motion is expected to continue through tonight. Maximum sustained winds are near 90 mph (150 kph) with higher gusts. Rapid weakening is expected to begin later today and continue through Sunday. Miriam is expected to become a post-tropical remnant low pressure area on Sunday, Sept. 2. 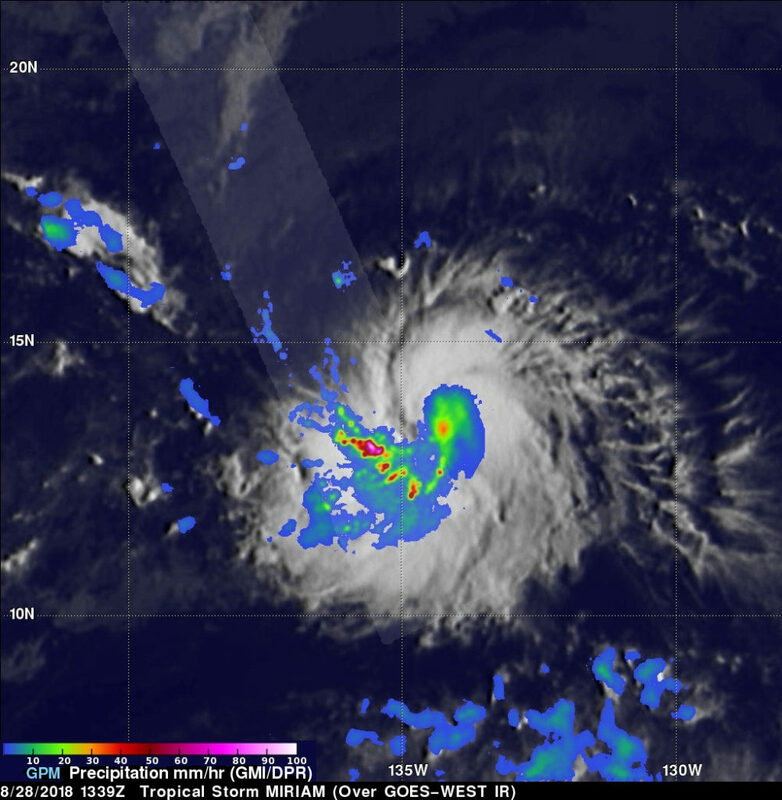 When NASA’s Aqua satellite passed over Hurricane Miriam, it was moving to the northwest and was no threat to land areas in the Central Pacific Ocean. 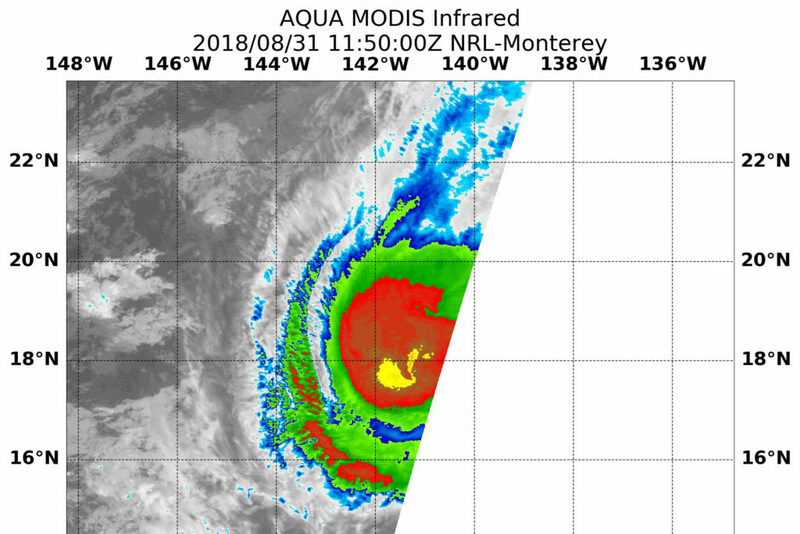 Aqua took a look at the storm in infrared light that provided temperature data to reveal the location of the most powerful thunderstorms that make up the tropical cyclone. 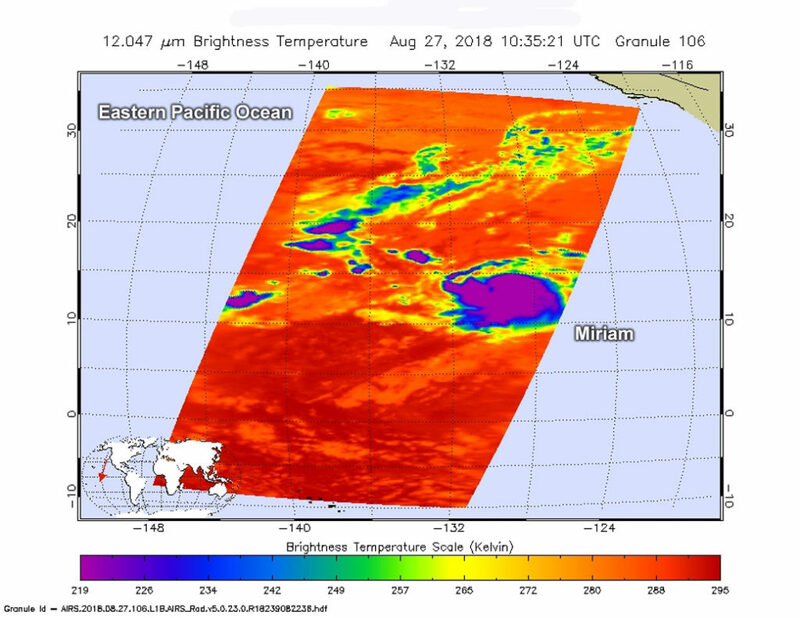 NASA’s Aqua satellite passed over Miriam on Aug.30 at 7:05 a.m. EDT (1105 UTC) the Atmospheric Infrared Sounder or AIRS instrument analyzed the storm in infrared light which provides temperature information. Temperature is important when trying to understand how strong storms can be. The higher the cloud tops, the colder and the stronger they are. AIRS saw coldest cloud top temperatures around the center and in a large band of thunderstorms extending east and south of the center. In both of those areas, cloud top temperatures were as cold as minus 63 degrees Fahrenheit (minus 53 degrees Celsius). Since the AIRS overpass, however, cloud tops have been warming in the southeast. There is also some drier air working its way into the circulation. On Aug. 30 at 11 a.m. EDT (5 a.m. HST/1500 UTC) NOAA’s Central Pacific Hurricane Center or CPHC noted the center of Hurricane Miriam was located near latitude 15.3 degrees north and longitude 141.6 degrees west. That’s about 940 miles (1,510 km) east-southeast of Hilo, Hawaii. Miriam is moving toward the northwest near 8 mph (13 kph). A turn toward the north is expected later today, with this motion continuing through Friday night. A turn toward the northwest is expected on Saturday. Maximum sustained winds are near 80 mph (130 kph) with higher gusts. Some additional intensification is expected today, followed by fairly rapid weakening Friday through Saturday night, Sept. 1. Hurricane Miriam heading northwestward across the Central Pacific and is expected to remain far away from land. At 5 a.m. EDT (0900 UTC) on Aug. 29, the center of Tropical Storm Miriam was located near latitude 14.2 degrees north and longitude 138.4 degrees west. That’s about 1,165 miles (1,875 km) east-southeast of Hilo, Hawaii. Miriam was moving toward the west near 13 mph (20 kph). A turn toward the west-northwest with a decrease in forward speed is expected by tonight, followed by a turn toward the northwest and north through Friday night. When NASA’s Aqua satellite passed over Tropical Storm Miriam Aug. 27 and infrared data showed slight improvement from the day before. On Aug. 28, wind shear was still affecting the storm. 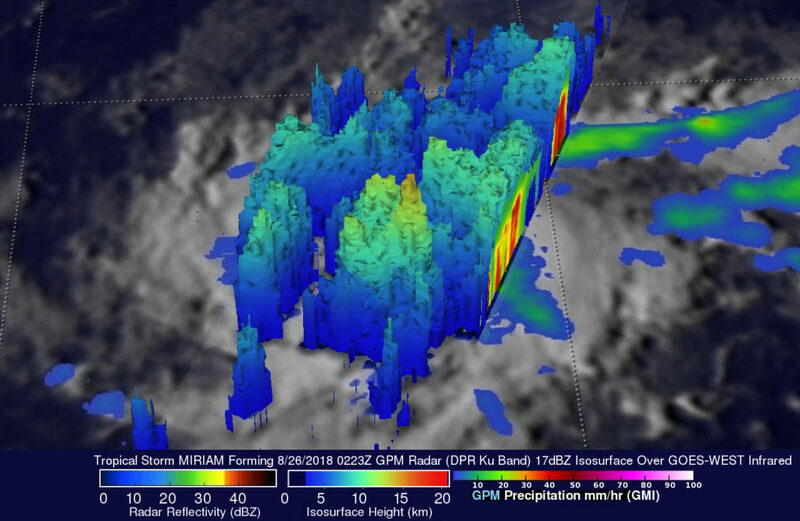 NASA’s Aqua satellite passed Tropical Storm Miriam on Aug. 27 at 6:35 a.m. EDT (1035 UTC). The Atmospheric Infrared Sounder or AIRS instrument analyzed the storm in infrared light which provides temperature information. Temperature is important when trying to understand how strong storms can be. The higher the cloud tops, the colder and the stronger they are. AIRS saw coldest cloud top temperatures being pushed slightly east of center by light vertical wind shear. Those cloud top temperatures were as cold as minus 63 degrees Fahrenheit (minus 53 degrees Celsius). Storms with cloud top temperatures that cold have the capability to produce heavy rainfall. At the time of the Aqua satellite overpass, Miriam’s cloud pattern and overall convective organization had improved from earlier in the day. On Tuesday, August 28, 2018, the National Hurricane Center (NHC) noted that Miriam’s cloud pattern had still not improved very much from Aug. 27. On Aug. 29, microwave data showed the low-level center still slightly displaced from the deep convection due to about 11.5 mph (10 knots/18.5 kph) of northwesterly wind shear. At 5 a.m. EDT (2 a.m. PDT/0900 UTC), the center of Tropical Storm Miriam was located near latitude 14.0 degrees north and longitude 133.5 degrees west. That’s about 1,480 miles (2,380 km) east-southeast of Hilo, Hawaii. Miriam was moving toward the west near 12 mph (19 kph), and the NHC said this motion is expected to continue through Wednesday. A turn toward the northwest and north-northwest is expected Thursday, Aug. 30 and Friday, Aug. 31. Maximum sustained winds remain near 65 mph (100 kph) with higher gusts. Some strengthening is forecast during the next 48 hours, and Miriam is expected to become a hurricane later today or tonight. At 11 a.m. EDT (1500 UTC) on Aug. 27 the center of Tropical Storm Miriam was located near latitude 13.9 degrees north and longitude 130.5 degrees west. That’s about 1,485 miles (2,385 km) west-southwest of the southern tip of Baja California, Mexico.